A COMPREHENSIVE new survey of bosses and employees in Singapore has thrown up a rather surprising finding - that local workers are actually quite satisfied with their work-life integration. However, data from the survey shows that this contentment comes not from any major lasting shifts in office culture or practices, but from ad hoc benefits. The poll, commissioned by The Straits Times and Employer Alliance (EA), took in responses from 1,000 employees and 500 employers across industries in Singapore. 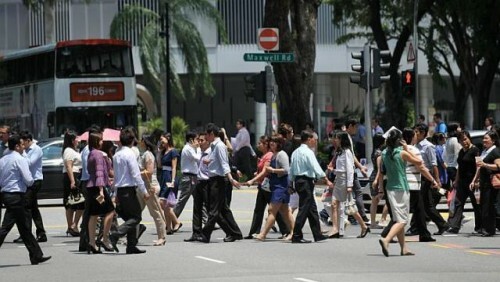 "It's the most in-depth survey on work-life integration in Singapore. Most surveys on the topic would just ask about whether the workers are satisfied or not, but this one drills deep into societal norms, desires and expectations," noted Ms Sharon Kok, the director of Degree Census Consultancy, which conducted the survey. Of the employees polled, 82 per cent said they felt they were generally in control of their work-life arrangement and only 6 per cent said they did not have the flexibility to integrate the needs of their work with their personal and family lives. Yet, each structured flexi-work programme such as job sharing or working from home had only ever been tapped by a fifth of the respondents or fewer. Instead, the top two most commonly used "work-life initiatives" were emergency leave and taking time off at short notice." When asked which were the initiatives they found most useful, these two were again voted top. EA chairman Claire Chiang said these findings give the lie to recent polls that have painted Singaporean workers as being miserable and disengaged. Rather, this poll shows they "love to work". "Usually when employees are disengaged, it's not because of the work itself but because of their supervisors. If their leaders are good, working hours will not be so much of an issue." But at the Tafep CEOs' Breakfast and Dialogue yesterday where the survey results were unveiled, Guardian Health and Beauty chief executive Sarah Boyd told some 60 business heads present: "I think for me, the ability to take time off at short notice or emergency leave shouldn't be considered a part of the frame of reference for work-life balance - it should be a basic human need... If Singaporeans were able to see what work-life balance and flexi-work means in other parts of the world, they would get a very different frame of reference for their decisions." To be sure, the survey indicates that despite their overall satisfaction, Singaporean workers, especially younger ones, do feel there is room for improvement. Among all workers, 84 per cent said their personal well-being would be better if they could manage their work and personal lives more effectively. Two-thirds of workers aged 30 to 39 said they would consider leaving a firm that lacks flexi-work arrangements. Of the 500 bosses polled, over 80 per cent said they felt work- life initiatives are important to improve employee satisfaction, raise productivity and retain talent. In some cases, bosses are even more open-minded than staff seem to think. For instance, only 55 per cent felt that staff should be in the office during working hours versus 75 per cent of workers who felt they were expected to do so. But bosses who want to implement structured flexi-work schemes said obstacles exist. Ms Boyd said her firm finds it tough as it does not have enough manpower. Others, like Gadgets.D. Legacy boss Ivan Choong, said employees sometimes have unreasonable expectations of flexi-work. But IBM Singapore managing director Janet Ang had encouraging words. "I would be bluffing you if I tell you that 100 per cent of the time for every employee at IBM, I feel 100 per cent trust that they are doing their job (while on flexi-work). But I will have to tell you the culture grows. You've got to believe it, execute it, hold people accountable and see the delivery of the results and if all that works, you have to trust them."